The structural landscape provides a holistic picture of small structural and energetic changes that take place during the late stages of crystallization of an organic compound. Any given compound is associated with a large number of putative crystal structures that lie in a small low energy window. Many of these structures are never accessed experimentally for reasons that are not fully clear. The landscape idea itself contains information about high energy crystalline forms, polymorphs, pseudopolymorphs, high Z’ cases which may hint about the probable molecular features based on the intermolecular interactions during the crystallization process. Studies of the crystal landscape could lead to an understanding of the kinetic pathways that control the crystallization processes. 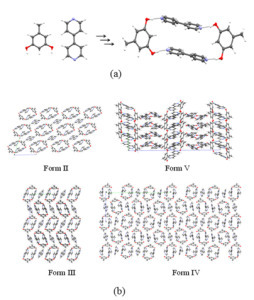 In general, the idea of crystal structure landscape collectively brings the essential ideas of modern crystal engineering: crystallization mechanism, high Z` crystal structures as well as polymorphism, and further emphasise the importance of kinetic features in the supramolecular synthesis. 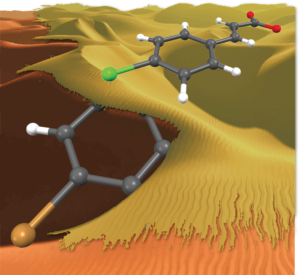 We have seen recently that the device of small chemical substitutions at innocuous positions of a molecule is an effective method of accessing crystal structures in the landscape of the subject molecule that cannot be so easily obtained experimentally. The device of solid solutions has been shown to be an even finer probe into the landscape. Chakraborty, S; Joseph, S; Desiraju, GR. Angew. Chem. Int. Ed., 2018, 57, 9279-9283. Chakraborty, S; Desiraju, GR. CrystEngComm, 2018, 20, 2793-2805. Dubey, R; Desiraju, GR. Angew. Chem. Int. Ed. 2014, 53, 13178−13182. Understanding halogen bonding and halogen…halogen interactions is important to employ these interactions as effective synthons in crystal engineering design strategies. 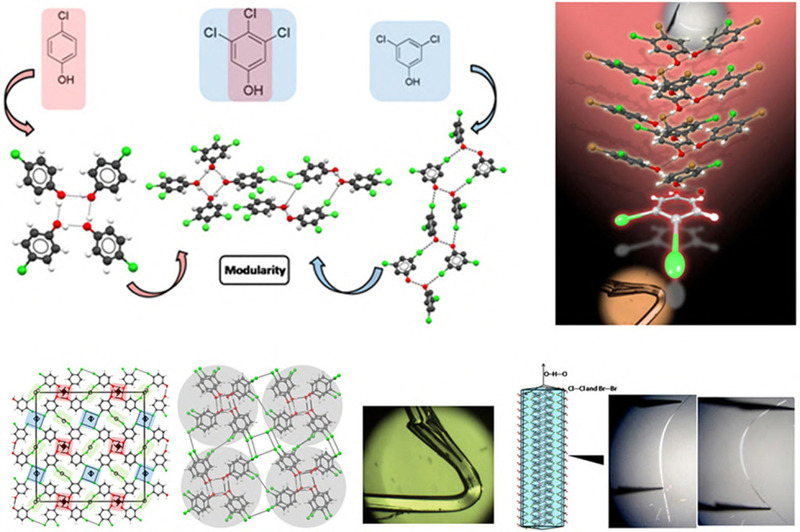 A recent unusual phenomenon of modularity in crystal structures in 3,4,5-trichlorophenol example illustrates that synthons can be transferred in a modular way so that such modules are connected by halogen bonding. Halogen bonding is important from the crystal engineering perspective as it can be helpful in determin ing and predicting crystal structures. Saha, S; Rajput, L; Joseph, S; Mishra, MK; Ganguly, S; Desiraju, GR. CrystEngComm, 2015, 17, 1273-1290. Mukherjee, A; Desiraju, GR. IUCrJ 2014, 1, 49-60. Mukherjee, A; Tothadi, S; Desiraju, GR. Acc. Chem. Res. 2014, 47, 2514-2524. Tothadi, S, Desiraju, GR. Chem. Commun. 2013, 49, 7791-7793. Tothadi, S; Joseph, S; Desiraju, GR Cryst. Growth Des. 2013, 13, 3242-3254. Targeted synthesis of higher-order cocrystals containing up to six components has been achieved. 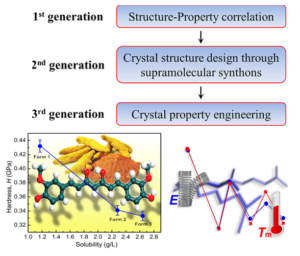 The synthesis of stoichiometric quaternary cocrystals has been achieved using the idea of Long-range Synthon Aufbau Modules (LSAMs) and in parallel by utilising the idea that when a molecule is in two distinct crystallographic environments in a lower-order cocrystal it becomes susceptible to substitution by a new molecule at the site where it is more weakly bound, if it is enthalpically advantageous to do so. Accordingly, a binary cocrystal acts as a stepping stone to a ternary, and so on. Thus, when all the possibilities of strong hydrogen bonds in a system have been satisfied, the crystallization of the system is guided primarily by close-packing, lending it to the possibility of forming solid solutions with molecules which are very close in shape and size and which do not disturb any essential hydrogen bonds in the system. Paul, M; Chakraborty, S; Desiraju, G. R. J. Am. Chem. Soc., 2018, 140, 2309-2315. Dubey, R.; Mir, NA; Desiraju, G. R. IUCrJ, 2016, 3, 102-107. Mir, NA; Dubey, R.; Desiraju, G. R. IUCrJ, 2016, 3, 96-101. Dubey, R.; Desiraju, G. R. Angew. Chem., Int. Ed. 2014, 53, 13178−13182. Chakraborty, S; Rajput, L; Desiraju, G. R. Cryst. Growth Des. 2014, 14, 2571-2577. Tothadi, S, Desiraju, G. R. Chem. Commun. 2013, 49, 7791-7793. Nanoindentation is an effective method to assess the mechanical response of solids with high precision, and on extremely small volumes. It provides useful information on the mechanical properties of polymorphic drugs, which in turn allows for developing an understanding of their stability in the solid state. We use nanoindentation and nanoscratching as tools to study mechanical anisotropy, interaction characteristics, desolvation processes, polymorphism, phase stability, and molecular migration in molecular crystals. It may be used as a direct measure of molecular and crystal energies of molecular crystals. In all these studies we try to understand these phenomena as a function of crystal packing. 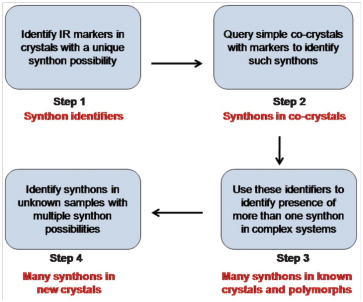 As in all types of crystal engineering, an understanding of the intermolecular interactions can lead to property oriented crystal design, and we have shown that complex properties may be deliberately turned on or off in organic crystals: one essentially fine-tunes the degree of isotropy/anisotropy by modulating interactions such as hydrogen bonding, halogen bonding, π···π interactions, and C−H···π interactions. Saha, S.; Mishra, M. K.; Reddy, C. M.; Desiraju, G. R. Acc. Chem. Res. 2018, 51, 2957-2967. Saha, S; Desiraju, G. R. J. Am. Chem. Soc., 2017, 139, 1975−1983. Saha, S; Desiraju, G. R. Chem. Eur. J., 2017, 23, 4936−4943. Mishra, MK; Sanphui, P; Ramamurty, U; Desiraju, G. R. Cryst. Growth Des. 2014, 14, 3054-3061. Mishra, MK; Varughese, S; Ramamurty, U; Desiraju, G. R. J. Am. Chem. Soc. 2013, 135, 8121-8124. Varughese, S; Kiran, MSRN; Ramamurty, U; Desiraju, G. R. Angew. Chem., Int. Ed. 2013, 52, 2701- 2712. Mishra, MK; Desiraju, G. R.; Ramamurty, U; Bond, A Angew. Chem., Int. Ed. 2014, 53, 13102−13105. Saha, S; Ganguly, S; Desiraju, GR. Aust. J. Chem. 2014, 67, 1840–1848. Mukherjee, A; Tothadi, S; Chakraborty, S; Ganguly, S; Desiraju, GR. CrystEngComm 2013, 15, 4640-4654. Pharmaceutical cocrystals are an emerging class of crystal forms in the pharmaceutical industry. Crystal engineering of an active pharmaceutical ingredient (API) offers a number of routes to improved solubility and dissolution rate, which can be adopted through an in-depth knowledge of crystal interactions. Pharmaceutical cocrystals that are obtained by design (crystal engineering) can enhance the solubility, bioavailability, release rates and/or stability of API crystal forms. 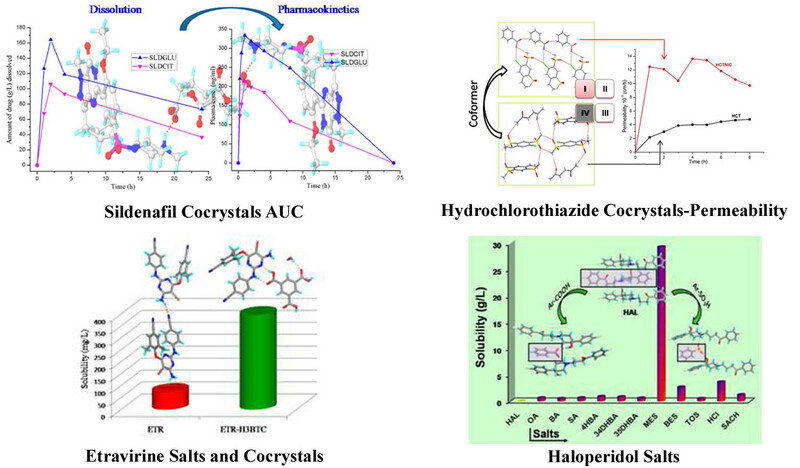 Crystal engineering of pharmaceutical entities with poor solubility and permeability (class IV) have shown appreciable enhancements in the two properties thus paving the way for highly bioavailable drugs. Crystal engineering also allows the possibility of designing combinations of drugs that have multiple therapeutic benefits which exhibit higher bioavailablity and release properties than mixed drugs. 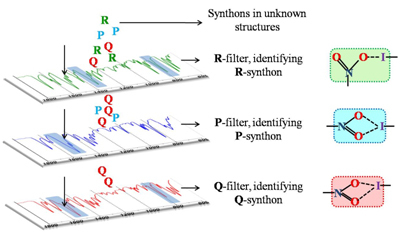 The group also focuses on different aspect of polymorphism, which include tautomeric polymorphism, synthon polymorphism, high Z’ issues, and additive induced polymorphism. Further, the principles of crystal engineering are being effectively employed in developing new drug forms that find applications in the pharmaceutical industry. Drug-drug cocrystals are examples where a drug combination can be considered as an alternative to commercially available physical mixtures. Rajput, L; Banik, M; Yarava, JR; Joseph, S; Pandey, MK; Nishiyama, Y; Desiraju, GR IUCrJ, 2017, 4, 466-475. Samie, A; Desiraju, GR; Banik, M Cryst. Growth Des., 2017, 17, 2406–2417. Gopi, SP; Banik, M; Desiraju,GR Cryst. Growth Des., 2017, 17, 308–316. Gopi, SP; Ganguly, S; Desiraju, GR Mol. Pharmaceutics, 2016, 13, 3590–3594. Banik, M; Gopi, SP; Ganguly, S; Desiraju GR Cryst. Growth Des., 2016, 16, 5418–5428. Rajput, L.; Sanphui. P.; Desiraju, GR. Cryst. Growth Des. 2013, 13, 3681-3690. Sanphui, P; Rajput, L. Acta Crystallogr., Sect. B 2013, 70, 81-90.